Denied more cash, how can Ottawa fund its controversial firearms-licensing program? Justice Department bureaucrats could not have picked a much worse time than December 5 to go to Parliament, hat in hand, to request more money for their gun registry. Just two days earlier, Auditor General Sheila Fraser had revealed gross financial mismanagement of the program, including "astronomical" cost overruns in the billion-dollar range. Now the department wanted another $72 million to tide the registry over for a few more months. Even Liberal MPs, virtually all of whom had voted for the registry in 1995, chafed at the notion of throwing more money down the registry sinkhole. In a last-minute maneuver, Liberal House Leader Don Boudria nulled the suplementary spending estimate from consideration by the House of Commons. Canadian Alliance MP and Opposition Finance critic Charlie Penson thinks pulling the funding request was an effort at "damage control. They were afraid they might lose the vote. The gun registry is just the latest item in a long list of mismanagement. The Liberals would like to have you believe they are good managers." Pulling funding for a program is unprecedented under the Chretien regime, Mr. Penson comments. "We've long tried to get them to cut back the spending estimates by even a dollar, and they will not budge an inch." 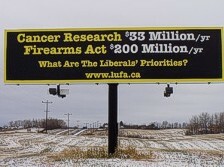 Even so, despite the clear loss of parliamentary confidence in the registry, he believes the Liberals will "try to fund the gun registry some other way. We'll be watching to see how they'll find the money." Some evidence in the federal auditor general's report indicates how the government may continue to secretly fund the program. Ms. Fraser says the Treasury Board  the government department that oversees all spending  extended a $40-million "loan" to the registry in 1996, which was to be repaid with interest by 2005. Instead, that debt was "forgiven" in 2000. In 1996, a further $55 million in funds earmarked for the Correctional Service of Canada and the National Parole Board was diverted to the registry. Ms. Fraser remarked that "Parliament was kept in the dark" about these transactions. Yet even with the diversion of funds from other programs, it is far from clear [how] the registry can achieve its year-end goal of recording all the firearms in Canada. By November 30, the Canadian Firearms Centre, which operates the gun registry, had registered 2.1 million gun owners and 5.2 million guns. The Justice Department claims there are 2.46 million gun owners and 7.9 million guns in Canada. But those totals are far too low, counters Jim Hinter, president of the National Firearms Association. "They arrived at those numbers through a public-opinion survey where they asked Canadians about firearms possession. Forty percent of the people they called hung up. Those were the gun owners. We estimate there are between five and seven million gun owners." Regardless, the government will never meet its deadline for registering all guns, Mr. Hinter continues. "If you are trying to get forms to register, you cannot get them. The phone lines have been jammed for months. How can Canadians possibly register on time?" The firearms lobbyist says the issue has gone beyond simple gun safety to one of competent fiscal management. "The debate's wide open. Where have the dollars gone? This was a bad law, poorly designed and now falling apart. You know our election lawn signs that say, 'Remember Bill C-68 when you vote'? That sign now has meaning for all Canadians."